How do I regulate WHEN Cronometer imports data from my vivofit3? Right now it imports data like at 7am ONLY so I get no credit for my exercise activities throughout the day. Hi @cbcdave your data should import whenever the data has synced to your fitbit app. Cronometer accesses your fitbit data via the app, not the device itsself, so ensure your device is syncing to the fitbit app first. If your Fitbit device is synced with the Fitbit app, please try un-linking Fitbit from Cronometer. Then on your computer, login to your Fitbit account. Once logged in, go to settings (gear icon) and then Applications. On this screen, you should see Cronometer (I've attached an example). Click 'Revoke Access' for Cronometer. 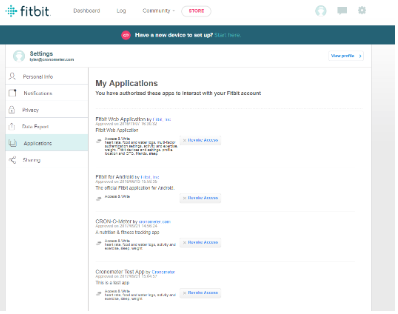 Re-link with Fitbit, making sure all permissions required are granted. Please let me know if this does not fix the issue. Thanks! Up and running properly!